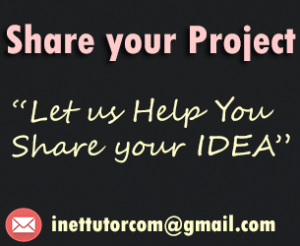 iNetTutor.com will provide new sets of tutorials which includes HTML, CSS, Photoshop , Programming Languages such as Visual Basic, Visual Basic.net, Java, C#, etc. and we will try to upload video tutorials on the said topics. Keep on visiting for more updates. This set of lessons and tutorials will provide you the basic knowledge of HTML through examples the easy to follow instructions and explanations. HTML stands for Hypertext Markup Language; it is the main markup language for creating web pages and other information that can be displayed in a web browser. HTML is a text formatting language. In simplest term HTML is used to create websites. In this lesson we are going to show you a sample PHP script on how to send email using the PHP mail() function. Note: the email address and the body of the message is the most important one, the rest are optional. Calculator is commonly used to solve basic mathematical operations such as multiplication, division, addition and subtraction. Calculator in Windows 7 offers lot of advance features such as programming, scientific and statistics. Type calc and hit enter. phpMyAdmin is a free software tool written in PHP, it is a browser-based platform used to manage and administer MySQL database. On the previous tutorial we have learned how to create a backup of our databases using the mysqldump command. Now we are going to reestablish or restore our database to its previous state. In this tutorial we are going to learn how to back up our MySQL database in WAMP using the mysqldump command. mysqldump command is used to export a database or all databases that resides on your MySQL Server. The exported file has an extension of .sql which commonly consists of SQL commands to create a database, create tables and insert records into tables. Click Start > Run then type cmd and hit enter. In this lesson we are going to learn how to use the MySQL alter command. There are lots of Graphical User Interface (GUI) Tools to manage our MySQL databases as discussed on this page (link), through that modifying the structure of a database as well as the structure of tables, the field data types and much more depending on the capability of that tool. All of that comes in a handy way because these tools has a drag and drop capability. The users can easily change the data types of a certain field, rename a table, and add new columns. In this lesson we are not going to tolerate those manners (drag, drop and click). In this lesson, we are going to learn how to determine the PHP version running on our server using codes. Open any text editor (notepad, notepad ++, etc.). SHOW command is used to learn more about the databases found in the server, tables found in a database, and specific information about the columns or fields within a table. Let’s take a look on the uses and examples of the SHOW Command. Note: the results may vary depending on the stored databases on your system. Where: database_name is the name of the database you want to drop or delete. Why should we manage the programs that run automatically when we turn on our computers? So many start-up programs may cause your computer run slow. Spyware, Adware and other malicious program executes during the start-up. Managing the start-up programs may speed up your computer system and it’s one way of optimizing the resources of your system by reducing the load during the start of your operating system. We’ve explained the reasons why we should manage the start-up programs. Now, let us proceed on the process of doing that.